Dallying In The Dirt, Issue #203--- Huntington Gardens an unexpected visit to a glorious place. It has certainly been a slow start to anything that looks like winter. This morning for the first time since early December, I can look out at the garden and see nothing but a carpet of fresh white snow. That doesn’t mean that we haven’t had the cold weather, that comes with winter in my part of the world. That is actually a part of the problem that will show itself in the spring. Snow is an excellent protective material. It buries the perennials and other plants and protects them from the harshest cold. It also stops the frost from penetrating as deeply. Its absence this year will surely show up in a slow spring as the deep frost emerges and I’m sure that some perennials and tender Roses will not be jumping out of the soil this spring. I actually shoveled the driveway twice yesterday, each time thinking that it had stopped snowing for the day. Mother Nature likes to laugh at me in the winter as much as in the summer. 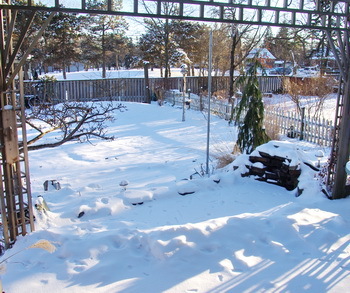 The backyard looks lovely but the driveway had more snow in it this morning despite my efforts. The Lotus seeds that I talked about last week, continue to do some strange and wonderful things. One has reached the top of the 35 cm of water and is now curling over and the seed has floated up from the bottom of the vase by about 6 - 7 cm. The top of the long stalk appears to be opening up into a leaf and another stalk is starting on its way up. Apparently it will produce four leaves this way. It’s fun to look at it every day, to see what it’s up to. Mid winter gardening excitement at its best. The escape from the snow is to go to the ski hill and enjoy it. Since I can’t do that every day I head to the basement and open up my seed box. Today is the last day of January and many of the small, long season seeds need to be in the soil. Begonias, in their many forms, have become more important in my garden since the demise of Impatiens. Begonias have some of the smallest seed that we home gardeners deal with. Begonia boliviensis is the one that I grow most commonly from seed and I have been using seed that I collected from last year’s plants. They produce an incredible amount of seed and I have been delighted to discover that it not only grows from those seeds quite easily but that it comes back true to type. B. boliviensis seed is quite expensive to buy, mostly because it is usually sold in a pelleted version to make it easier to handle. 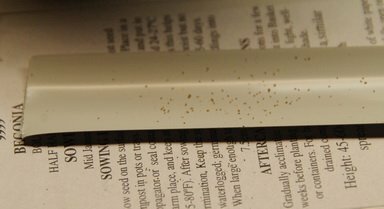 You can see the tiny specks of dust in the picture but if you are deliberate in spreading it slowly and evenly, it germinates quite well. Use a very fine seeding media, level it in the seed tray and spread the seed on top. I then press it gently to make a firm surface and that makes sure that the seed is in contact with the soil. Be careful that whatever tool you use to press with, does not have the seed sticking to it. Water it thoroughly by soaking it from the bottom and then put in a warm, (24 C, 75 F soil temperature,) bright location and wait. From tiny specks, glorious blooming plants do develop. I had a lovely break from winter last weekend. My Garden Writer’s Association had its winter board meeting and I was “forced” to go to Pasadena California to attend. Everyone should have a little hardship in their lives. The meeting usually goes until noon on Sunday but we were efficient this year and wrapped up on Saturday evening. What does a group of Garden Writers do with a spare day in the sunshine. We visit gardens, of course. Two friends and I spent most of the day at Huntington Gardens. This 120 acre estate is justifiably world famous and I had never had the opportunity to wander through it. No garden tourist should consider their list complete until they have seen it. Like any garden it changes with the seasons and in January the desert garden, or at least the old world section, was a blaze of colour. Forget that 15 cm pot on your windowsill with an Aloe sitting in it. Imagine it 20 times larger and displaying a huge inflorescence with hundreds of brightly coloured blooms. 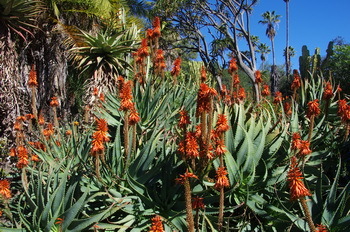 A lot of oranges, some reds and a few brilliant yellows and in this garden, there are hundreds of Aloe plants joining in this display. Frequently when I’m giving my presentation on house plants, I’m asked if they will bloom and as you can see, the technical answer is yes but it’s not likely to happen in your 15cm pot. You will have to come and listen to my lecture to see all of these magnificent pictures. We are going back to Huntington Gardens in the fall and it will be interesting to see how a different season displays itself. Dana Asks? I was doing some fall gardening cleanup for a friend who was ill. Her husband told me to cut the stalks and leaves of her yucca plants down . So I did - cut everything flush to ground level. Now I am wondering if I completely ruined then ? . Will it take years for them to grow back ? Ken Answers! The hardy Yuccas are a tough bunch but you may have given them a very large challenge. Most are evergreen and retain some of last years leaves until the next spring. These leaves can then provide some energy to produce this years crop and hopefully a flower stalk. Many of last years leaves will wither and die before the end of season. Without those overwintered leaves it will be interesting to see if the root has enough resources to push up new leaves this spring. Don’t give up too soon. Irene Asks? This summer and fall, ants, wasps and green worms have been helping themselves to our kale, lettuce, and swiss chard. Our neighbour has a huge white pine whose branches extend over 1/2 of our yard. Could the sap that finds its way onto our greens be attracting these bugs? Any suggestions would be appreciated. Ken Answers! Irene sent me this question late last year and I’ve finally got around to answering. The problem is that I have no real answer. Her suggestion that the Pine sap might be attracting things to Kale, that would otherwise ignore Kale, is probably a good guess. Cutting down the offending Pine is probably not a viable option. Since the Pine sap is very sticky, regular spraying with water will probably not remove it very effectively, although it would be worth trying. Any readers out there have a good idea? ?